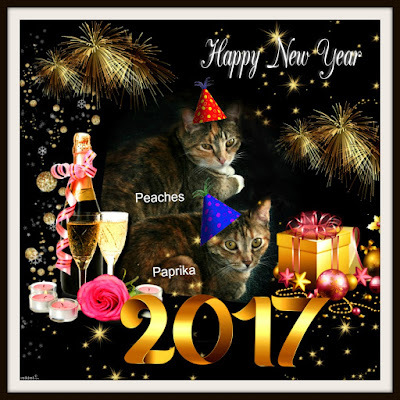 Peaches and Paprika: Happy 2017 to our friends! Happy Happy New Year to all our dear kitty friends. We and our human are so glad to have stumbled across your blogs & hops and are grateful for your friendship. We wish you LOTS of meows, purrs, love & laughter in 2017. Happy New Year! We wish you all the best. We love your New Year's card/selfies too. Happy New Year from all of us at Brian's Home! A Happy and Healthy 2017 to all 3 of you! Thank you for putting together all those great slideshows. Happiest of new years to you! And best of luck to momma on the bird book! We're huge bird fans over here, too. Especially the humom, who takes way more photos of birds than she should. Whoa, that's cool about the birds! Best of luck to your Human with her exhibit! Wishing you a 2017 filled with all of life's blessings including love & light! Happy New Year! We hope Mum enjoys her birds - we will visit when we can. Happy Mew Year Dear Peaches and Paprika and Mom! We hopes you gets some rest from all the blogging fur a bit while your Mom photographs birds... Wishing lots of loves and purrz and laps to nap on. -Katie Kitty Too and Katie Mom.